A significant challenge of objective setting for Internet marketing is that there will potentially be many different measures such as those in the list above and these will have be to grouped to be meaningful. Categorisation of objectives into groups is also useful since it can be used to identify suitable objectives. In this chapter, we have already seen two methods of categorising objectives. 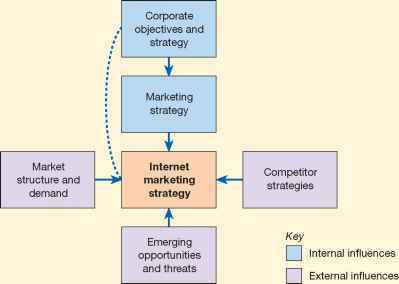 First, objectives can be set at the level of business effectiveness, marketing effectiveness and Internet marketing effectiveness as explained in the section on internal auditing as part of situation analysis. Second, the 5S framework of Sell, Speak, Serve, Save and Sizzle provides a simple framework for objective setting. A further five-part framework is presented in Chapter 9.